Following 34 years of service with the Israel Security Agency (ShinBet) and with the Israel National Police, Chief Superintendent Asher Ben Artzi has retired. He has M.A. degree in Adminisration from Haifa university. In his tenure with the Israel National Police, he served as the Director of the Security Department and then the Director of INTERPOL & International Operations. In this post, Chief Superintendent (Ret.) 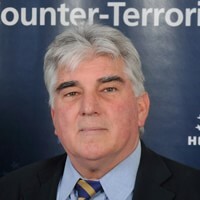 Ben Artzi administered and directed the Israel Police Interpol Division and was responsible for interchange of criminal intelligence with other international police services and with intelligence agencies dealing with drugs and organized crime. Chief Superintendent Ben Artzi duties, regarding international drugs and organized crime included also Extraditions, Criminal activities of Israeli citizens abroad, Legal assistant to foreign police representatives in Israel and legal assistance from foreign police and intelligence agencies of other countries. During his position he cooperated with the Federal Agencies of the US ( FBI, DEA, Secret Service) and other agencies all over the world. He was in charge for the Police Attache' in Washington and Los Angeles. He also represented the Israel National Police to the Church in the state of Israel . Chief Superintendent Ben Artzi commanded and was in-charge of the Israel National Police attaché and representatives overseas and responsible for liaison and communication with foreign police and intelligence agencies serving in Israel. After his retierment , Chief Supt. Ben Artzi is the CEO of IPSC , International Police & Security Consultants. He is a Research Associate at the ICT in Israel, a lecturer in Varna University in Cyprus ( department of Public Security) and a member in the Board of Advisors of the Dead Sea Scrolls Project in Princeton University, USA. He is a partner in IMS Cyprus www.ims-cy.com International Maritime Security , and in SPARTA www.spartaltd.com Security Solutions, Training & Technology.